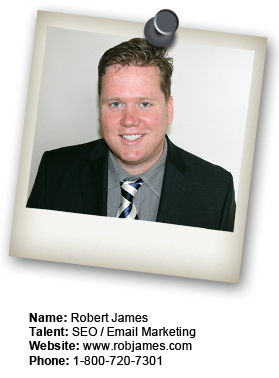 Rob James has been involved in providing Internet marketing results for his public and private clients since 1996. We've developed the marketing results method of delivering highly targeted Internet traffic. The results of our efforts have given us the ability to deliver better quality products, services, and support. Our products, services, and support are tools for your online business to get visitors who are actively searching to do business. Proper Internet "marketing results" or marketing an online business is distinct from traditional marketing due to it is one of most cost-effective investments available. Unlike the traditional push marketing method(s), in which the advertising message is broadcast without regard to a consumer's expression of interest or at best to loose demographic audiences, our Internet marketing results have the unprecedented ability to connect businesses to users who are genuinely expressing interest in the marketed products or services. Please feel free to browse and learn about what we can offer or do for your online business. You may also visit our Site Search page. Copyright © 1996 - 2014 Rob James. All Rights Reserved.